Most people want to avoid lawyers. They are in the same class as cops; you do not want one until you need one. In the startup world, there are plenty of articles written about how lawyers ruin startups or stall innovation and deals. But there is a growing awakening that, while lawyers themselves may be perceived as obstacles, the legal profession and industry represent opportunity. This sector, which historically has been ignored by entrepreneurs and investors, is beginning to experience a startup invasion. Here are six key facts that make the legal industry ripe for disruption and innovation. 1. The US legal industry is roughly a $300 billion market. This includes the traditional lawyer-to-client transactions, the expert tools that lawyers rely on, and the technology lawyers use to provide their services. What this amount does not include is the under-reported and untapped demand by middle-income individuals and families for more accessible legal help. It also does not include the billion-dollar legal education market. Most of this money is caught up in antiquated and stale processes and mechanisms that represent a significant target for innovation and transformation. 2. Technology is in its infancy. Tools and platforms that have reached many other sectors are just now beginning to enter legal. For example, data analytics – while massive in other commercial markets – is barely existent in the legal sector. Data is abundant in the legal profession – everything from a company’s entire email archive to the information that exists in all the filings and briefs that lawyers create. Lawyers work with and create data every day. Currently, the vast majority of this data sits idle, untapped and unused. What resides in this data is the potential for creating products that predict outcomes in cases, quantify and qualify lawyer performance, and create transparency within the legal process itself. For one example, see LexMachina, a company putting analytics to work in the IP realm. 3. There is a definite supply and talent problem. While roughly 40,000 students graduate law school every year (this may be declining in coming years), most are unprepared to actually represent clients or do any substantial legal work. Those lucky enough to gain employment with a law firm will rely on the firm to train them, a practice that yields anything but consistent and comprehensive training. Outside of firms, these new lawyers will need to find alternate paths to becoming competent lawyers, and their choices are severely limited. This creates a unique over-supply, limited-talent phenomenon where the available lawyers are not adequately trained to actually be lawyers. Startup opportunity here lies within edtech and scalable instruction. Is there a Khan Academy or Udemy model for new lawyers? 4. Access to lawyers is historically a problematic and costly effort. Middle-income Americans tend to avoid lawyers because they do not want to pay high fees, nor do they know how to find a reputable and trustworthy lawyer. Many legal needs are going unmet due to this phenomenon. By lowering cost structures, lawyers would be able to serve this immense market. Through a combination of technology, tools, and processes, platforms are being built to do just that. But the market is in its infancy. Even though RocketLawyer and LegalZoom have a head start, they have only scratched the surface. 5. Lawyers used to be the gateways to protected information and knowledge. They were the conduit through which clients accessed legal information and guidance. With the advent of technology, this information is now more accessible than ever before. The general public is able to locate relevant and helpful information without the assistance of lawyers (or at least without paying fees to lawyers). There are still many resources that lawyers do have control over, but these are diminishing greatly. PlainSite and LawGives are two recent plays in this space. 6. Finally, and most importantly, the world is getting more complex, not simpler. Corporations are burdened with greater oversight and compliance obligations. Some companies even use the legal process (and all its costs and distractions) as a way to punish or hurt competitors (see patent trolls). Consumers and the public are also more aware of their legal rights and obligations. In our “lawsuit happy” nation, neighbors and friends will sue each other in an effort to gain – rightfully or not. Creating alternate paths to litigation, or avoiding problems altogether, are huge opportunities. There are ways to bypass lawyers and the court system entirely. For example, a former executive at eBay has built Modria as a platform for dispute resolution that involves no lawyers at all. 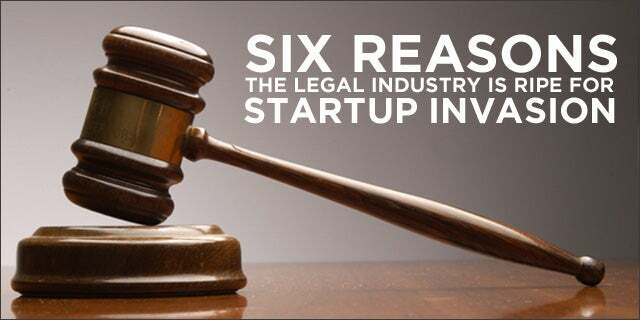 There are many other facts and reasons why the legal industry represents real and significant opportunity for startups. For a profession and industry that literally impacts every single person in dozens of ways, it would seem that the need and urge to innovate would be palpable. Startups need to stop looking at lawyers as a pain, and see them as an opportunity. If you cannot avoid them, disrupt them.